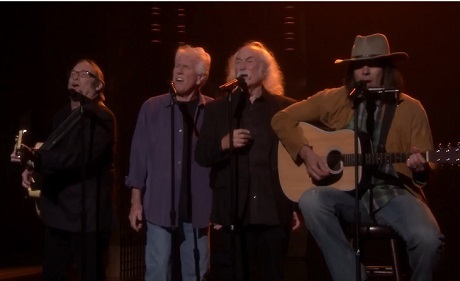 Tonight Show host Jimmy Fallon dusted off his cowboy hat, fake sideburns and harmonica holder last night (July 7) to once again channel his inner Neil Young and tapping into the pop zeitgeist with a rootsy cover of Iggy Azalea's mega-hit "Fancy." Strumming on a beat-up acoustic guitar, Fake Shakey uses a familiar, sinewy singing voice to detail all that goose-and-cris-influenced murda business and trans-continental travel. Joining him later on are David Crosby, Stephen Stills and Graham Nash, who gleefully sub in for an absent Charli XCX and lock into a four-part harmony about tasting all that gold. You'll find CSNYF's stuntin' with their comedic cover down below.